Here we are for another birthday. 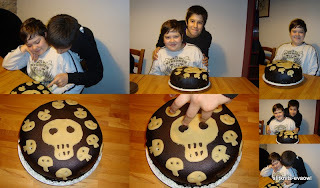 Matija has turned 12 and 12 were ment to be the skulls flying around the big one. I have to admit that they turned out more like creeepy medusas, but I was trying to beat my record of baking-in-a-hurry... and this was the result. Eating the cake was far more delightful. It was a three layer sponge cake with strawberries and whipped cream. Mmhhh. Meet Her Majesty Betti II.